PALMER — A beetle infestation already decimating Susitna Valley spruce trees worsened sharply this summer. 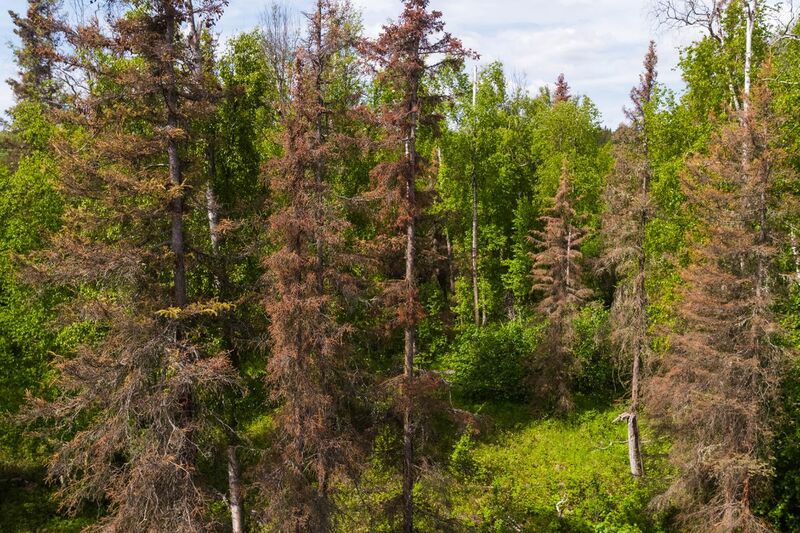 Spruce beetles killed trees across nearly 558,000 acres of forest this year and mostly in Mat-Su, according to an update released Monday by the U.S. Forest Service and Alaska Department of Natural Resources. That brings the total area hit by Alaska spruce beetles to nearly 1 million acres since the outbreak started in 2016. It's increased twofold every year. Researchers also say the numbers don't necessarily reflect the total acreage killed by beetles, just those spotted during aerial surveys. Spruce beetles are native to Alaska and outbreaks have occurred throughout history, researchers say. The beetles thrive in warmer conditions, and Alaska is experiencing higher temperatures amid climate change. The current outbreak could have years to go, a federal scientist said. The worst one in recent history lasted through most of the 1990s and munched across 4 million acres of trees. Warm, dry summers and mild winters ahead could allow the beetles to complete a life cycle in one year instead of two, said Liz Graham, a Forest Service entomologist. "That contributes to increased damage levels," Graham said. "This may just be the beginning." Teams doing aerial surveys spotted much of the recent beetle activity in the Mat-Su and the northwest Kenai Peninsula, according to Monday's update. 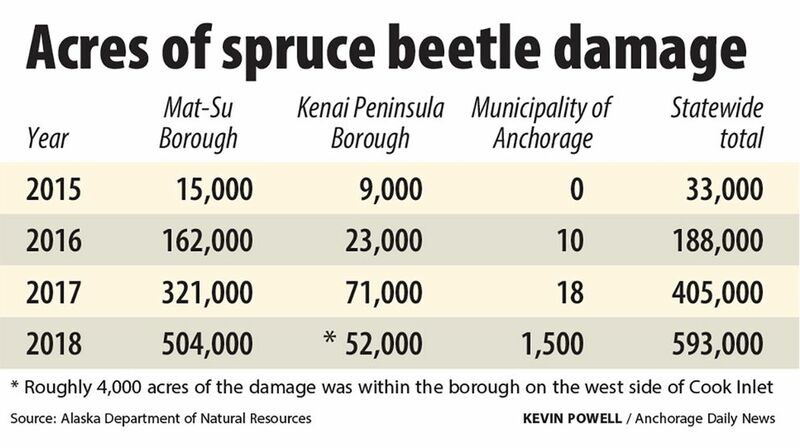 Over 500,000 acres of active spruce beetle damage was observed in Mat-Su valleys. They mapped about 48,000 acres on the Kenai as well as about 1,500 acres around Eagle River and Chugiak and scattered, small pockets within the rest of the municipality. Property owners can protect high-value spruce that the bugs have yet to attack with regular watering and other steps, including limited use of pesticides, according to an online guide available at alaskasprucebeetle.org. Once trees are infested, there's little landowners can do, researchers say. Cutting up and removing dying or recently downed spruce is recommended.